Duncan Aviation avionics technician, Patrick Klein, tests a NAT TH250 tactical communications unit on the bench in front of nine NAT test sets. Northern Airborne Technology Ltd (NAT), dba Cobham Avionics, designs and produces avionics communications equipment installed aboard helicopters. These units control the audio voice transmissions between the pilot and co-pilot and from the cockpit to the crew/cabin. One of the more common failures that Duncan Aviation technicians have experienced with these units is intermittent audio squawks. The audio transmitted by these units passes through relays or electronic switches. As relays begin to lose conductivity causing poor contact, intermittent audio is the result. At this point the unit needs to be repaired or overhauled. Duncan Aviation has full overhaul and repair capabilities on many NAT units. These capabilities are continually growing as customers call and request to send their units to Duncan Aviation for repair or overhaul. If a request comes in and we don’t have a current test set capable of repairing their unit, we build it. And it doesn’t take as long as you might think. We are able to order the manual, build a test set, perform the repair or overhaul AND return the unit to the customer typically quicker than the OEM can do a repair. Duncan Aviation currently has a total of 12 test sets specifically built to troubleshoot and test hundreds of different Cobham (NAT) models and part numbers. Call a Duncan Aviation avionics tech rep to inquire about our repair and overhaul capabilities for your Cobham (NAT) unit. 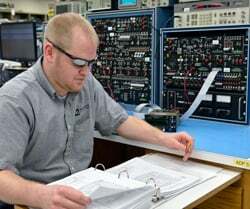 Duncan Aviation provides comprehensive avionics and instrument overhaul and repair services, and we are an avionics and instrument authorized service center for more than 50 of the top equipment manufacturers. Our capabilities listings are available online in our inventory and capabilities search. Dan Magnus is an avionics instrument technical representative located at Duncan Aviation's Lincoln, Neb., location. He specializes in ADF, Comms, Control Heads, CVR, DME Gables Control Heads, Receivers, Nav-Comm/Receivers, Radar Systems, GPS, GNS, Transponders and UNS Components and Systems Specialist. His aviation career began in 1976.